If you've never ordered a JAM jingle package before, you may be wondering how to go about it. It's actually an easy process once you understand what's involved. Getting a jingle package produced is very different from ordering other types of production for your station. 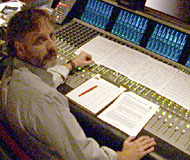 A voice-over session, for example, can be done by one person with very little pre-planning. But a jingle package requires the talents of many people, and lots of preparation is required. It is a time-intensive hand-made process. Every jingle you order is written, arranged, sung, mixed and edited just for you. Jingles result from the creative effort of a large group of people. No one can push a button and have your jingle package come out instantly. Nor are jingles a stock item sitting on a shelf, just waiting to be shipped out like a production library. As the Latin plaque near our front door says, "It Takes Time to Make Things." The process really begins when you identify your needs and start looking for a package that fits. You can hear demos of well over 100 different JAM packages online at the Demo Download page. Or you can contact your JAM sales rep and request the latest demo CD that matches your format. Jingles come in many different styles and lengths, so be sure to listen to as many demos as possible. You will find that even within the same format, packages can have very different instrumental and vocal sounds. And if you can't find what you want, please ask us for help. Don't assume that what you want doesn't exist, or can't be done, just because you haven't heard it yet. Although you might opt to do a custom package, let's assume you're looking for a syndicated (existing) package which sounds right for your station. Consider all the available packages, and find one which is close to the sound you want. Remember that you can change the lyrics to reflect your slogans and station personality. After deciding which cuts you want, and finalizing contract and price details, writing the lyrics is the next step. You can write your own lyrics for the cuts you've selected, or we can suggest lyrics based on your input. Either way, don't treat this step casually. We will sing each cut exactly the way you tell us, so make sure that everything is precisely the way you want it. Your lyric doesn't necessarily have to match the original number of syllables; there are lots of ways to alter the vocal arrangements for a good fit. But be reasonable! If you try to replace "All Hits!" with something like "The Number One Hit Music Station in the Greater Tri-County Area! ", you may be disappointed with the results. If we detect a problem making the lyrics fit musically, we'll let you know before the session. You should also think about your logo; that is, the melody we will use every time the name of your station is sung. If you want it to be similar to the logo heard on the original demo, that's easy. But if you have another tune in mind, perhaps one which your station has used for many years, let us know what it is. We'll try our best to incorporate it into your package. Clients are often surprised by the fact that every note of every jingle is written out in advance. (The singers don't just stand around the microphones and "make something up!") The process of writing out new vocal arrangements that contain your words is called "adapting," and it can be quite time consuming. That's why it's so important for you to think about, and submit, your lyrics way in advance of the session. Also, we use many different combinations of singers to create the right sound for each package. JAM always tries to faithfully replicate the sound you hear on the demo, so the correct singers must be used for each project. That involves a lot of booking and scheduling. It takes hours of pre-production planning before we ever get in the studio. You are certainly welcome to attend the recording session and watch the entire process unfold before your eyes and ears. However, if you can't make it, don't worry. The majority of our clients don't actually come to their sessions. If the lyrics and special instructions have been thoroughly discussed and documented prior to the session, everything will go smoothly. Clients equipped with ISDN lines can listen to their session without having to leave home. After your jingles are sung, there is still much work to be done. Your jingles have been recorded in a multi-track digital format. They must now be "mixed." This is when the music track, singers, effects, and so on, are all balanced to form the final product, which will be provided to you on CD or uploaded to a secure area of our website. We give a lot of attention to the mixing process because it really determines what your package will sound like. Mixing a syndicated package can take several hours; mixing a custom package takes several days. When the mixdown is complete we upload the full-quality WAV files to our secure FTP site. You'll receive download instructions and a password to retrieve the files. We can also supply your master on a CD and mail that to you. JAM keeps a safety copy of everything we do in case your audio ever gets lost or damaged. Finally, we provide you with a master log sheet which gives you the lyric and mix details about every file, or track on the CD. Now your package is ready to hit the air! Even a package of short jingles requires hours and hours of work. At certain times of the year our sessions are booked weeks in advance. So don't wait until the last minute, especially if you have a deadline. Give us both enough time to do the job right. You'll be rewarded with a superior JAM product which will make you sound great.